How Can I Display Weather Information on My Computer? It’s as easy to look up weather information on the Internet as it is to find anything else online. It just take a few clicks, typing a URL or fetching a bookmark, waiting for a Web page to load, then clicking for specific data if it’s not the default display. What could be simpler? How about automatic, always-displayed, always-current summary (today/tonight/tomorrow) weather data displayed without occupying prime display real estate, with more details available by mouseover actions and full details via one click, PLUS warnings of severe weather or other hazards? This free service is another reason to run the great Firefox browser. Simply install the 1-ClickWeather add-on from Weather.com to add display items to the right side of Firefox’s status bar, an otherwise unused area. It supports all platforms on which Firefox runs, and it’s free! In Firefox, click Tools, then click Add-ons and Browse All Add-Ons. That will open the main Firefox Add-ons page; enter 1-ClickWeather in the search box and press Enter. Click the add-on name to read about it, click the Reviews link to read user comments, or click Add to Firefox to install it. Once it’s installed, explore extensive options to display the information you want in your preferred format. I display current weather, tonight’s weather, and tomorrow’s weather, each showing a maximum or minimum temperature with a symbol for sun/rain/wind/snow/etc. Mousing over each of those pops up more data. And clicking each summons the appropriate Weather.com Web page with complete data and buttons for many more options. To the left of the three displays, I have mouseover/clickable icons for a selected real-time weather map, weather videos, and hour-by-hour and ten-day forecasts. An alternative is Weatherbug, offering a free ad-supported download or equivalent ad-free fee-based service. 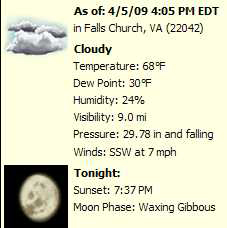 Supporting PC and (with Beta software) Mac, Weatherbug adds a small temperature display near the Taskbar clock, providing one-click access to radar, forecasts and more on WeatherBug.com, plus severe weather alerts. Weatherbug promises that its extensive nationwide network of tracking stations allows it to provide live weather information and more localized alerts.